How to include Box2d with v3.17? change i to j, it will be fine,I think. Did someone solve this issue? I’ve the same problem. include <Box2d/Box2d.h> not work in 3.17. You having same issue for both iOS and Android? It would be really great if some cocos2d-x developer explained how to do this. I included $(PROJECT_DIR)/../cocos2d/external/Box2D/include in Build Settings > Header Search Paths and now it works. I’m now experiencing this issue as well with version 3.17 and it seems that the Box2d headers were removed from the /external/ folder. The only Box2d file I can find in the cocos project is /Frameworks/libbox2d.a. So the previous suggestion to add a search path to a header which no longer exists cannot work. Just download Cocos2dx v3.17 from the download section of this website. 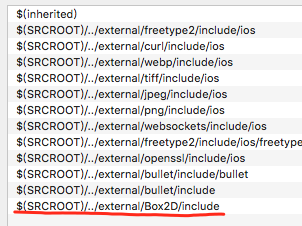 there is a “/external/Box2D” folder. 100%! In your Code use it like : #include "Box2D/Box2D.h"
Has anyone included Box2D for a Mac project? It should work for Mac also. Please check what that include is added for Mac project settings. I added it in the scheme MyGame-desktop instead of the scheme MyGame-mobile. Is that what you’re trying to say? If yes, it doesn’t work. I’m using CocoaPods in the project. In Podfile i configured only MyGame-mobile. But box2d is another thing… (no pods). Sure. It’s a setting problem in my project… i’m sure. @dimon4eg you could reproduce my error creating a new cocos project. After that, compile it (in mobile). You will see the error. Compile again. It will work. You will see the error again. And… then… how to fix it on desktop…? Do you have a Desktop target? Did you add the Box2D path there too?